Kissing Crane Polished Chrome Lighter | BUDK.com - Knives & Swords At The Lowest Prices! 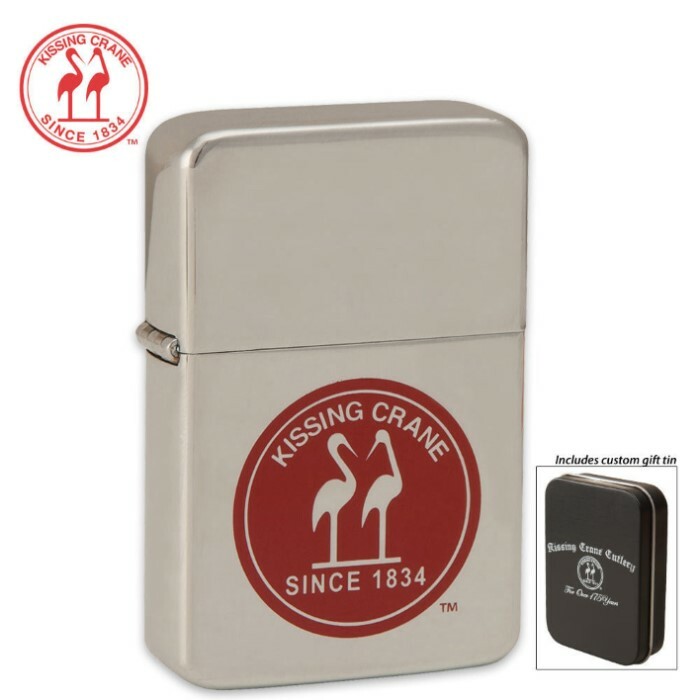 This windproof Kissing Crane lighter gives you the quality craftsmanship you've come to enjoy at a bottom-line price. This polished chrome lighter bears the classic Kissing Crane logo on its front. Each lighter is crafted with precision and guaranteed to perform. (Fluid not included). Got this lighter on the BOGO sale. Was kinda of doubtful at first but thought for $9 and I get one for free why not. Must say Very happy with this purchase lighter works great. Comes in nice lil tin box as well. Have bought a couple more through the BOGO deal to carry in my truck and camping gear as backups. Got a great deal BOGO on these lighters, all work as good as any Zippo out there! Kissing Crane is quality and this lighter is quality. Compare it to a Zippo and it equals it. At half the retail price it's a great deal but having it on sale at BOGO Free I couldn't pass that up. That came to $4.50 each. You can't beat that deal. Have one for each Bug Out Bag. Good to go!! !